How to Train Your Dragon is one of my kids new favorite shows and we just adore the new dragon Light Fury. 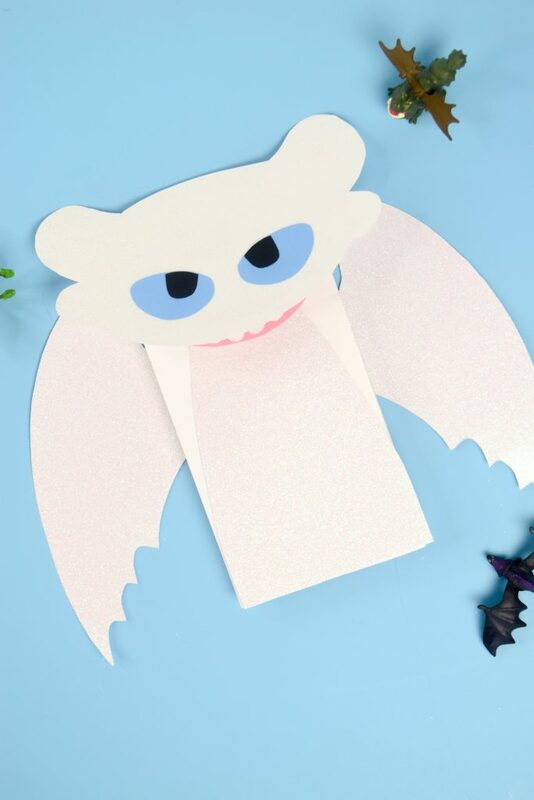 So much in fact, we decided to make a Light Fury Puppet and it turned out adorable! 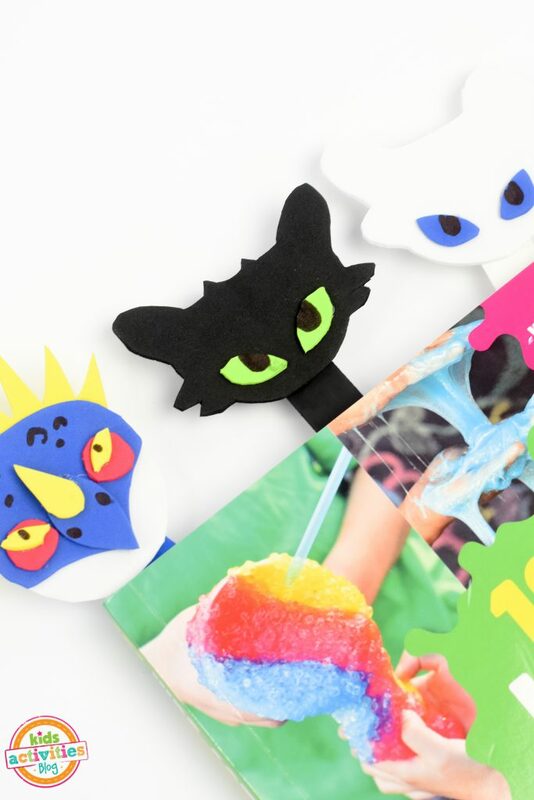 If you like Toothless’s new love interest as much as we do, you just have to make this fun craft! First, start by tracing out the size of your paper back onto the white glitter cardstock. You want to lightly do this with your pencil. Next, roughly sketch out the silhouette of Light Fury’s face and a body silhouette. It doesn’t have to be perfect, just a quick sketch of her face. Now, cut it out and set aside. Take another piece of white glitter cardstock, fold the paper in half then sketch out some wings. Cut this out and set aside as well. Take your blue piece of cardstock and fold in half horizontally. Sketch out an oval eye shape and cut it out. You’ll have 2 exact pieces if you cut it while folded together. Cut the two pieces in half so you have 2 separate eye pieces. 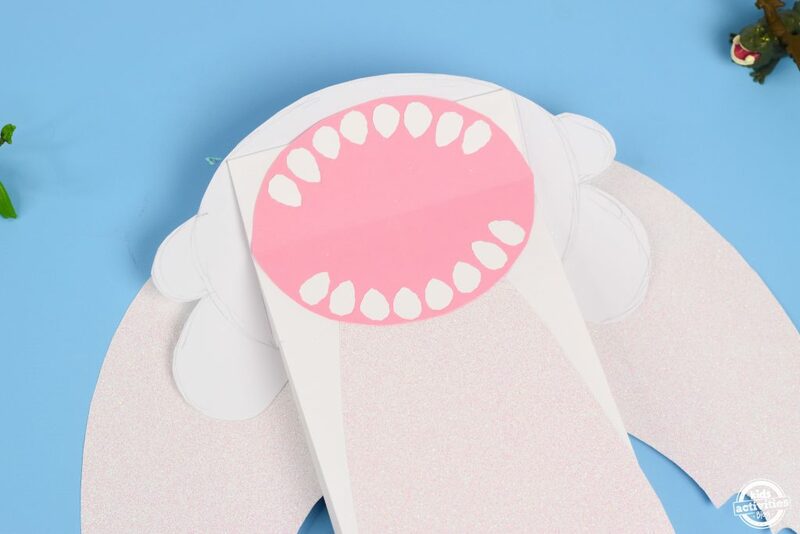 Now, take your pink piece of cardstock and fold in half horizontally. Then measure the width of your bag so you can sketch out a round piece (for the mouth) and cut it out. Take a small piece of your white cardstock and fold it several times until it’s a small square. Then trace out a teeth-like shape. 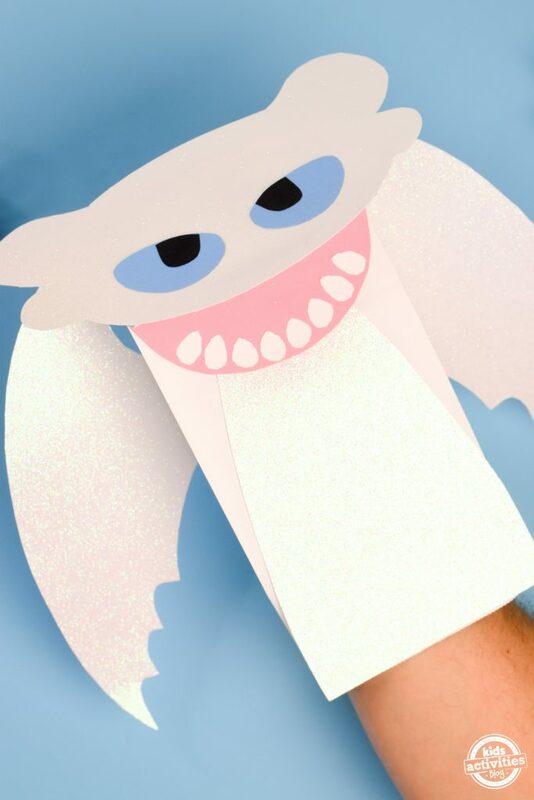 Cut these out (because these are folded, you’ll have several of the same teeth cut at one time). Repeat until you have about 16 teeth and glue these onto the pink mouth part. Now, glue all of the details on. 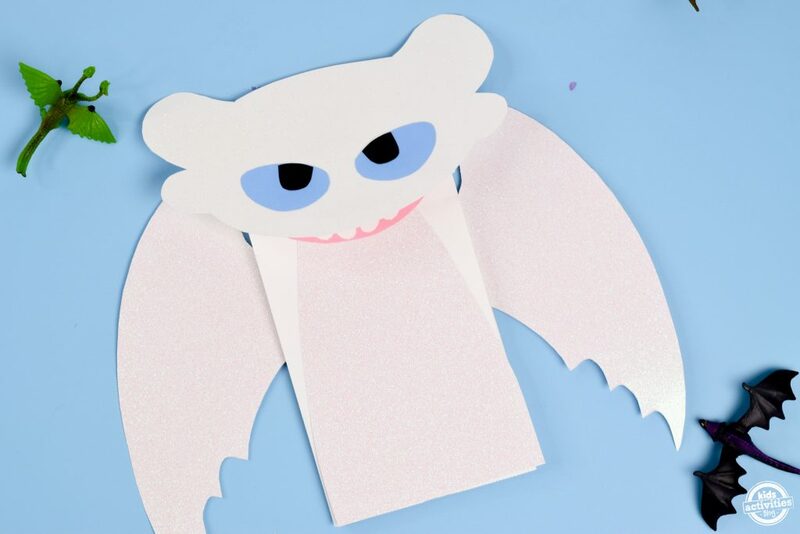 The body silhouette and the face will go onto the top of the paper bag, the wings will go onto the back side and the mouth piece will go onto the bottom opening so when you open the puppet, the mouth opens and closes. They blue eyes will go onto the top of the face. Finally, use the black paper to cut out pupil shapes for the eyes and glue them on. You can also use a marker to draw in pupils into the blue eyes. You’re done! 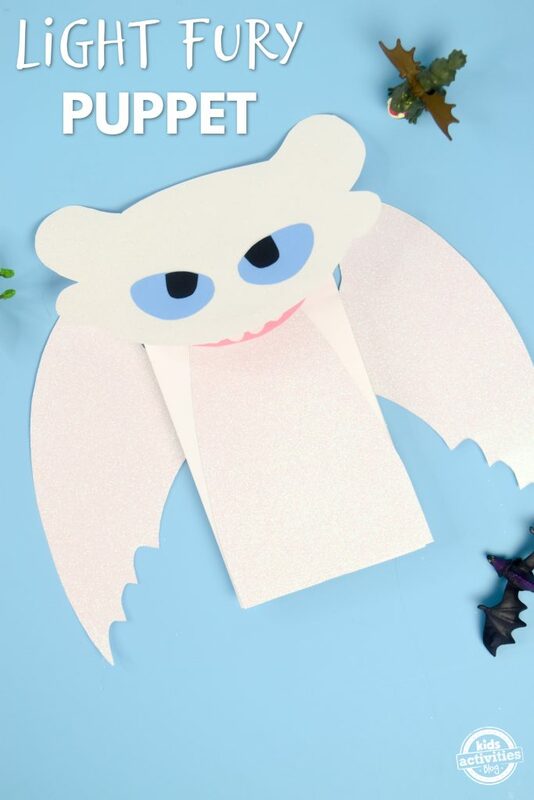 You’ll have a totally cute Light Fury Puppet!